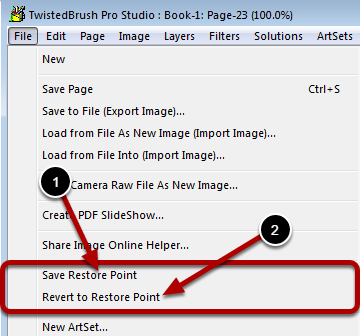 A restore point is a complete copy of your image stored to disk for later retrieval. This is useful for cases where you want to experiment but may decide to come back to this exact version of your image. Restore point are limited to one per page and remain until you create another restore point for that page. The Save Restore Point will save your current page for later restoration. A restore point can also be saved from the Quick Command panel. The Revert to Restore Point will restore your last restore point for that current page. A restore point can also be saved from the Quick Command panel. Automatic restore points are also created at various points. These points are when the normal Undo action will not be available such when resizing a page. An automatic restore point can be recovered using the Undo action. 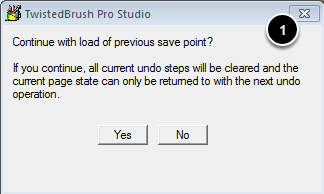 When all the normal undo steps have been restored and Undo is activated again a dialog will appear asking if the restore is desired.